“Through Badman, we are showing our colours as B.A.P while showing a new style to everyone as well,” said Jongup about their third mini-album. When asked which member was the most ‘bad man’, he answered “Himchan-hyung”, while giving the ‘good man’ title to “our leader, Yongguk-hyung” (who couldn’t seem to hold his shy smile back as he heard that). As a group, they all agreed that looking back on their concert tour, seeing fans from every country cheering passionately for them made it very memorable. And for Daehyun, he said because he didn’t expect so many fans to turn up to see them in Singapore, he is very thankful and personally feels that being in Singapore is a very special memory for him too. BAP will be performing their first concert in Singapore, BAP Live On Earth, at The Star Theatre @ The Star Performing Arts Centre tonight at 6pm. 1. What is your first impression of Singapore? Yongguk: Singapore is very clean. There are a lot of kind people. We also heard that our Babyz in Singapore are very pretty. 2. There were many of your fans who queued up for two days, and didn’t go to school or sleep well just to get tickets to the concert. 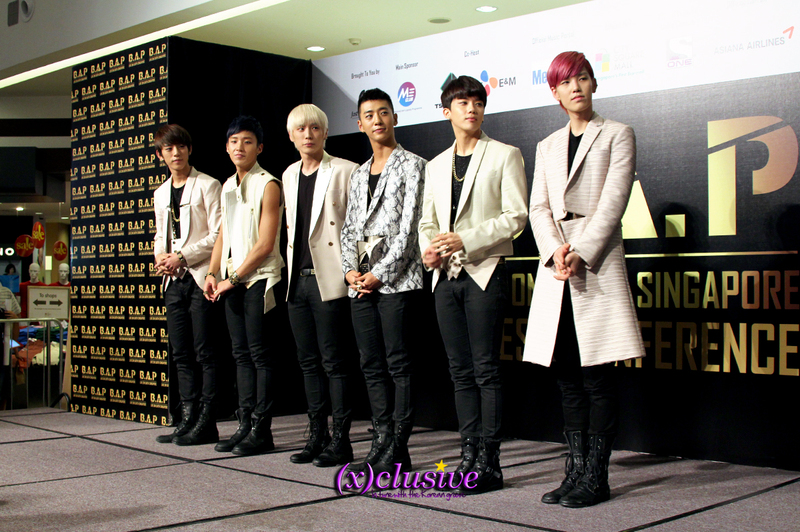 We want to know what does B.A.P love about Singapore Babyz? Yongguk: We appreciate all of you for the love you have shown us. As much as all of you have worked hard, B.A.P will present the best performances to everyone. 3. What is your favourite local dish or what is one local dish that you would love to try? Himchan: When we came to Singapore last year, we had chilli crab. We hope to have it again this time round as well. 4. What can Babyz look forward to at your first concert in Singapore? Youngjae: We have lots of special performances lined up and we will be performing new songs as well. Please look forward to our concert. 5. You have filmed several music videos, some in the USA, Philippines and Malaysia. When are you going to film a music video here in Singapore? Himchan: Singapore is a beautiful country and we think that we would be able to film beautiful scenes here! 6. It’s been 20 whirlwind months since you made your debut last January. Could you share with us one special memory you’ve had through all these times? Daehyun: There are a lot of memorable moments but here in Singapore, we didn’t expect so many people to turn up and we are very thankful for that. So personally, I feel that this is a very special memory for us, this moment. 7. The new single, Badman, has just been released not long ago. Can you tell us more about this song and amongst B.A.P, which one of you is a ‘bad man’? Jongup: Through Badman, we are showing our colours as B.A.P while showing a new style to everyone as well. I think in our group, the most ‘bad man’ would be Himchan-hyung. 8. So who is the ‘good man’? Jongup: In my opinion, that will be our leader, Yongguk-hyung. 9. Last year, B.A.P won many awards, like the Best Rookie of the Year. What are the achievements that you hope to make over the next year? Yongguk: Our third mini-album, Badman, has just been released so we hope that a lot of people will give a lot of support to our new album. Zelo: We would be very thankful if we receive awards. We are always striving to do our best, especially in promoting our current new album now. 10. Over the past six months, you have been touring the world. How has it been like for all of you? What is something that you can always remember about this whole concert tour? Daehyun: Looking back on our concert tour, fans from every country are always cheering very hard for us. The images of all these fans from all around the world cheering so hard for us is very memorable. For more photos of B.A.P, visit our Facebook page or Flickr!